Who says comfort only comes at a price? The Prestige Condensing Wall Mounted Boiler features a uniquely designed stainless steel heat exchanger and offers up to 95% efficiency. The Prestige has the capability to modulate the firing rate to 25% of its rated input and is available in 5 inputs; 60, 110, 175, 250 and 399 MBH. This modulation means fewer cycles resulting in lower operating costs. The unique TriMax Control makes installation use fast and easy with 60 second easy set-up. The TriMax allows for multiple circulatory and temperature zones and has an integrated cascade feature to join multiple boilers. 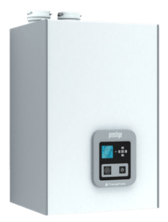 The Prestige Excellence Series combines a High-Efficiency Condensing Stainless Steel Wall Mounted Gas Boiler with a built-in “Tank-in-Tank” Indirect Fired Water Heater. In addition to the reliability and economy of a, 110 Series Stainless Steel Condensing Boiler the Prestige Excellence Model’s 14-gallon in-cabinet Indirect Fired Water Heater is capable of producing 180 GPM of domestic hot water. The Smart Series Stainless Steel Indirect Fired Water Heater intelligently uses the heat created by your home’s boiler system to heat your water. The result is a reliable, abundant supply of domestic hot water delivered from a less-than-abundant amount of fuel – a notion as pleasing to your senses. NTI is a 100 per cent Canadian-owned boiler manufacturer with more than 30 years of experience. Our family-operated business manufactures only top quality hydronic heating equipment and furnaces. Acknowledged as a leader in research and product development, NTI is a pioneer in developing the most advanced and efficient home heating equipment. 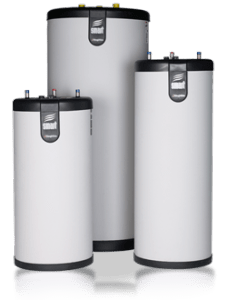 You will realize exceptional value with equipment from NTI: high quality, low maintenance equipment, and our tankless, efficient domestic hot water coil system will eliminate the cost, space and inefficiencies of a separate hot water heater. Not to mention the savings of up to 40 % less fuel consumption. Save today and in the future. Have an in-floor heating project? Use ‘Heat-Sheet” under the slab. Ensure the ground is reasonably level. Install a vapor barrier if required. Place Heat-Sheet panels. Interlock the panels together and create a running bond pattern. The Bradford White (TTW®) model is a power vented option. They offer a wider flexibility in venting arrangements, as they can be vented through the roof or through the wall, with 2″ or 3″ Type 636 PVC pipe. They also offer increased recovery, which means the water heats up faster while being used for longer usage cycle dependability and efficiency without temperature drops. 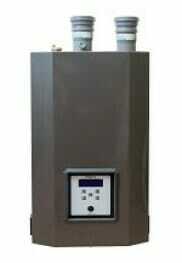 Bradford White also offers a mid and high-efficiency model option for tankless water heaters. The Mid Efficiency Bradford White Infiniti Tankless™ Water Heater Series with SRT™ (Scale Reduction Technology) is a non-condensing model with an input of 199,000 BTU/Hr., a single modulating burner for an even flame, and an all-copper heat exchanger and waterways. The RTG-199ME achieves a 0.83 Energy Factor.